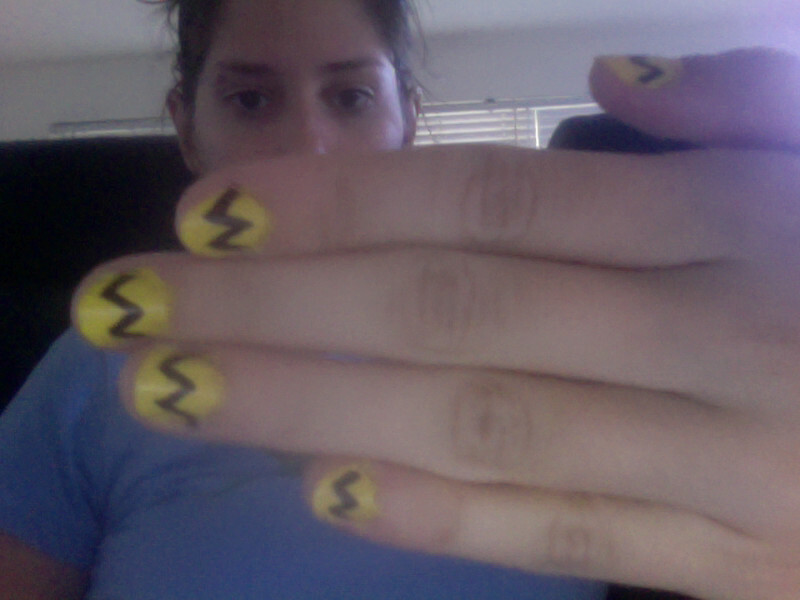 Some Charlie Brown inspired nails! Sorry about this A-W-F-U-L photo, but I needed to grab a pic before these got all chipped and gross. I bought Julep's "Daisy" as part of a promotion for the Julep Maven Box. It came with a set of three and I only paid one cent! As fabulous a deal as that was, it turns out I'm not a very big fan of cream polishes such as Julep's. Yellows always require several coats (and this one may have only needed two if I used a base coat), but the finish is not quite matte, not quite shiny. And although the bottle says it contains 8 ml of polish, it seems I've already ran through half the bottle in two or three manicures. As for topcoat, I adore Nubar's "Diamant." It was six bucks a bottle on ebay, but it is also the best topcoat I've ever used. It doesn't make the colors run and it protects my manicure for about a four days (which is a LONG time for me, a nail-biter). Well, anyway, I've been receiving compliments nonstop about these nails. They must really evoke something from childhood.